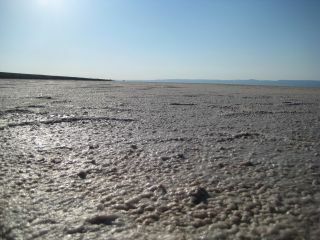 The salt pan at Chott el Jerid in Tunisia is similar to environments found on Mars. In an effort to learn whether Mars could host life, scientists have been trekking to some of the most Mars-like places on Earth. These spots, such as the freezing Antarctic, dried-out salt pans in Tunisia, and the corrosively acidic Rio Tinto river in Spain, often host life on our own planet, so the question remains: Can similar locales support organisms beyond Earth? Field trips to extreme locations on Earth aim to shed light on this question and help scientists interpret the data returned by intrepid robotic explorers on Mars, including the recently landed NASA Curiosity rover. "The big questions are: what is life, how can we define it and what are the requirements for supporting life?" Felipe Gómez, leader of the project at Spain's Centro de Astrobiología, said in a statement. "To understand the results we receive back from missions like Curiosity, we need to have detailed knowledge of similar environments on Earth. Metabolic diversity on Earth is huge. In the field campaigns, we have studied ecosystems in situ and we have also brought samples back to the laboratory for further analysis. We have found a range of complex chemical processes that allow life to survive in unexpected places." During three visits to Tunisia's Chott el Jerid salt pan between 2010 and 2012, the researchers set up weather stations to measure surface and air temperatures, humidity, ultraviolet radiation levels, wind direction and velocity. Such measurements mirror the type of data being collected on Mars now by Curiosity's Remote Meteorological Monitoring Station (REMS). "We studied measurements in different locations over several daily cycles," said Gómez. "As well as the large-scale changes to all the parameters through the day, we observed a small rise in the surface temperature after dusk. We found that this is caused by water condensing on the surface and hydrating salts, which releases heat in an exothermic reaction. This is very interesting from the perspective of the REMS instrument on Curiosity — it gives us a way to follow when liquid water might be present on the surface." This weather station at Tunisia's Chott el Jerid salt pan was used to study whether similar environments on Mars could host life. In Chott El Jerid, as well as in Chile's Atacama desert, the scientists drilled down into the ground to analyze soil samples, which revealed different types of bacteria living at different depths. "In both Atacama and Chott El Jerid, we found ecosystems at a depth of a few meters that were completely isolated from the surface," Gómez said. In Spain's Rio Tinto, the researchers took samples of bacteria from areas with and without iron, and exposed the organisms to ultraviolet light. They found that the bacteria without iron were destroyed, but the microbes exposed to iron survived. "What the bacteria we found in Rio Tinto show is that the presence of ferric compounds [containing iron] can actually protect life," Gómez said. "This could mean that life formed earlier on Earth than we thought. These effects are also relevant for the formation of life on the surface of Mars."